Life is richer with friends, that’s for certain. 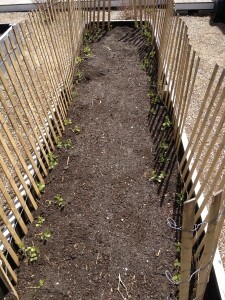 In our case, the DPW has just helped us out with some pea fencing – a bit extra from the town lot. How great is that?! Everyone is working together to enable our children to grow more delicious food for their school lunches. Hope all our friends from the DPW will stop by for one of those lunches too! We’ve been talking all about starting a garden, teamwork, sharing and new beginnings like soil and planting seeds. Happily, with rich soil, care in watering and a bit of sun, our little pea seedlings are poking out of the ground and beginning to stretch for the sky. Exciting! 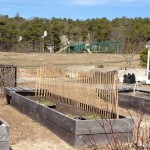 The 6th graders set up the pea fencing along the perimeter of the garden boxes. 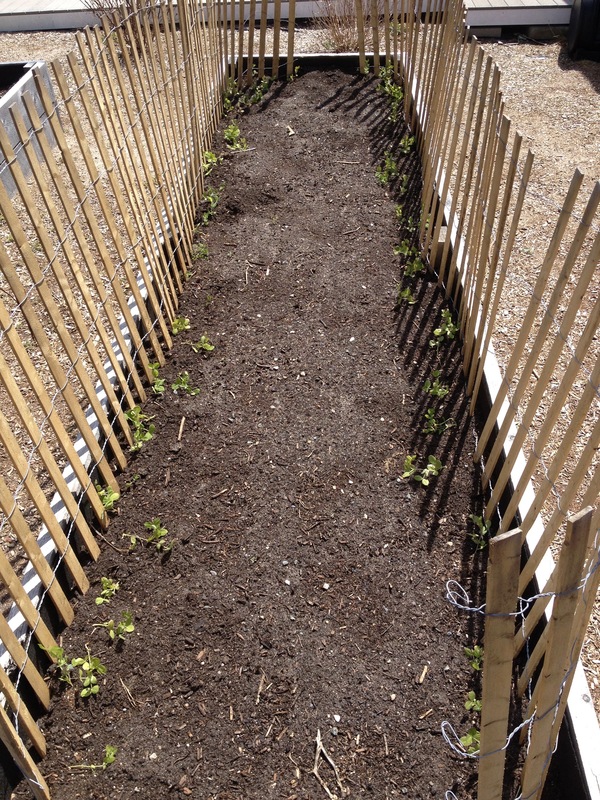 The pea starts were planted near the fencing so they can easily clasp it and gradually climb their way to the sky. By growing the vines vertically, space is conserved for a bigger yield, the plants are less apt to be attacked by ground insects/diseases and the airflow keeps the tender tendrils dry and healthy. We know the shoots are delicious, as we’ve been eating the pea tendrils, grown in the classroom windows. That’s why our first line of defense and choice for staking the pea plants grown outside is to use snow fencing. In our neck of the woods, bunnies seek out a varied diet of greens and flowers. They, too, love the nutritious packed and delicious peas. Nibbling away can decimate our harvest, even if our rabbit friends only wish to share in the bounty. By building a barricade, the bunnies prefer to hop on to easier pickings. Truro is where the first Pilgrims stepped onto dry land upon reaching America. It’s also where these starving explorers discovered and “borrowed” corn from the Native Americans. Without this discovery, and the harvesting and storing knowledge of the native residents, the Pilgrims likely would have perished. On field trips our students have explored Corn Hill Beach, named in memory of the corn stored there by the Native Americans. We have helped to establish a seed bank at the Truro Public Library. Here residents can actually borrow (or “check out”) heirloom seeds. They can then plant and grow them, harvest the seeds and bring back more than they checked out in the fall. It’s a way to contribute to our community, to participate in both borrowing and giving. Because that’s, in essence, what friends do. 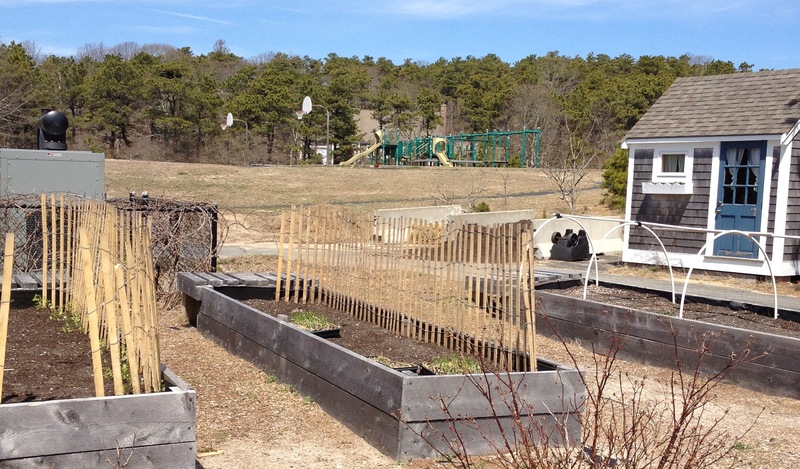 Local growing was first documented by the Pilgrims right here in Truro. Local food is a heritage of the region and through the garden the children are learning all about friendship, “borrowing”, sharing, giving back – and even alternative (bunny-proof) methods of growing legumes. Who knew gardening could be a history lesson, a lesson in friendship and kindness, and yield practical rabbit re-directing experience. But that’s what we’re up to with our gardening work, showing that by working together we can grow a new generation of healthy, happy and caring people. So… we hope our DPW friends do drop by for lunch. We’d love to share! Lightweight fencing such as snow fencing pictured above. Wire fencing with stakes can also be used. Poles, sticks or bamboo shoots can be used to make teepees. Same method with large sticks for the tee pee method: hold securely and tap down (be sure sticks are 1 foot deep). Tall person ties the sticks together as pictured above. * Children should be at least 7 years old and proficient in rudimentary tool use. Two hands are required- a great bilateral activity! When pounding down fence or stakes, the eyes better be guiding the hands! Children learn basic tool use and a simple lesson in construction.